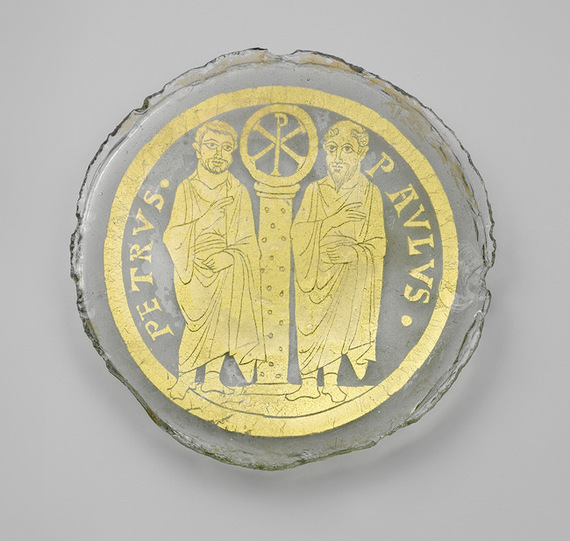 Image credit: Glass bowl base with saints Peter and Paul flanking a column with the Christogram (monogram) of Christ, dated to the late 4th century A.D. Metropolitan Museum of Art, New York (16.174.3), Open Access Collection. Credit Line: Rogers Fund, 1916. It's a remarkable statistic. Almost 70% of America now lives in a state with marriage equality. When they write our history two thousand years from now, do you think they'll say, "What made the Americans all turn gay?" It's a preposterous question--we aren't standing on the threshold of marriage equality because the LGBT community found a way to convert everyone--yet that's the way many of us have been taught to think about transformational periods in history, like the rise of Christianity. Social change is supposed to happen by "conversion." Think about what you read in high school history class about that time long ago when Christians literally had to risk their lives by "coming out" to their friends and neighbors. It took three centuries after Jesus' death, but that's when Christians finally won the right to practice their faith openly--no fear of being thrown to the lions anymore. A huge political triumph! So how did they do it? Did Christians really succeed in winning their new legal status by "converting" their friends and neighbors? That's what most people still believe, buying into the Sunday-school version of history. Some scholars still think so, too. They've tried to argue that Christians made up more than 50% of the population within decades of their political victory. The assumption? In ancient Rome, once you were touched by a Christian, you turned into a Christian. It's an absurd way to talk about anyone's identity--gay, lesbian, Jewish, Muslim, black, Latino, or other. But that's how generations of scholars and church historians have tried to explain the rise of Christianity. Sadly, it makes everyone in a toga sound like a school kid afraid of cooties. The stunning successes of the LGBT community, by contrast, suggest that not every political victory is dependent on someone else's "conversion." Much of time, social change depends on conversation. Remarkably, that's what new research has showed about the history of the Christian church. As I show in my new book, "the Christians" weren't the standoffish clique historians frequently make them out to be. Many Christians, in fact, were perfectly good Roman citizens. Shockingly, though, very few people have ever gone back to listen to the stories of the quieter ones who lived their lives without any hint of drama. These Christians went to the race track, where Rome's gods were honored. They went to the baths, where the gods were honored, too. They even participated in civic sacrifices, the very thing hordes of modern scholars continue to insist "the Christians" did not do, blinded by their own religious biases (or their bigotry). Yet the picture is clear: many of Jesus' followers lived hyphenated lives. We need to do a better job talking about them. After all, what was their reward? They were written out of history, pushed to the side so that their more outspoken peers, the "martyrs," could take pride of place on the marquee. Yet their lives shed light on important debates in religion and politics today. Some people would like to think, for instance, that the earliest Christians were champions of "religious freedom," and that's how their group won greater social visibility. Unfortunately, this thesis doesn't hold up to historical scrutiny. Christians won their rights by embracing many mainstream Roman values, not rejecting them. In the early first century A.D., Jesus' followers were teaching each other to follow traditional codes of behavior so as not to stand out from their neighbors. Women were taught to obey their husbands; children, their parents; and slaves, their masters. These "family values" were not Christian inventions, even though we still stumble upon them in "the Bible" (in Colossians and Ephesians). The "pagan" Aristotle had voiced the same ideas, in the fourth century B.C. The trend continued. By the second century, Christians were being taught to honor the Roman emperor. That exhortation is found in the letter known as 1 Peter, a canonical book of the Bible. Men and women who died for refusing to honor "Caesar" apparently chose to ignore the suggestion, but many Christians are known to have honored the Roman emperor without fuss. By the mid third century A.D., even two bishops in Spain took part in a local celebration--exactly the sort of festivity the "martyrs" shunned. We know because the two men earned the wrath of another bishop, in North Africa, who tried to convince his listeners that such a despicable act of identity juggling "had been predicted to happen at the end of the world!" Of course, the Roman Empire never came to an end just because some Christians had learned to do two things at once. Just the opposite, in fact. Within two generations, all of Jesus' followers would win the right to worship as they pleased. The best guess for how many Christians there were in the Roman world at the time of their "victory"? Ten percent of the empire. Maybe there really is no mystery to how or why Christians triumphed in Rome. By virtue of their creative ability to do two things at once, many of them had showed their friends and family to see Christianity in a less threatening light. The lives of these "quieter Christians" change virtually everything we've been taught about Christianity. Now, amid so much social change of our own, might be the perfect time to go back and re-learn everything we think we know about the history of the early church.